When’s the Best Time to Replace My Front Door? There are plenty of different ways you could improve your home, and some of them are much simpler than others. In fact, in certain ways, you can make one change and this will have a dramatic impact on the whole home. A good example of this would be the exterior door. There are numerous reasons why you should consider replacing your front door and there are signs that will let you know when it is time to do so. The nice thing about replacing this all-important door is that it will only take a few hours to complete. This is not a project that takes days or weeks, and it is the perfect option for the weekend warrior. So, how do you decide if it is time to replace the front door? Does it open and close seamlessly? Does it drag or catch at any point? Is it hard to get the door to latch closed? Are there gaps between the doorframe and door? If you are having any problems with the functionality of the door, then it is likely warped. This can happen due to extreme changes in temperature, bad weather on a regular basis, and problems with humidity. If your door is warped, it can be frustrating to use, for one thing. Additionally, it could be allowing too much air in, and that means it is not energy efficient at all. The aesthetic quality of your door matters because it affects the look of the whole home. For example, the rest of the exterior of your house could look nice, but if the door is weathered, dented, faded, or cracked, then this will ruin everything. Remember that the front door is likely going to be damaged over time due to outside elements. Sunlight, excessive rain, hail, wind, and other things can have an impact on how a door looks. So, if it doesn’t look good anymore, it is time to replace it. You will find that this one change can completely change the aesthetic of the whole home. It’s an easy way to renovate without spending thousands of dollars. If you are especially concerned with your energy bill and you want your home to be as energy efficient as possible, then you will want to look into changing that front door. It can be a serious energy leak. If your door is old or outdated, then it is time to replace it. You can consider the best materials, like steel and fiberglass. Even if you like the look of a wood door, you can get one that is wood on the outside and steel on the inside. That way, it will be energy efficient and will have the aesthetic you wanted for your home. When you begin shopping for updated doors, you will find that you can base your decisions on energy efficiency, if you would like. That way, if you want to do everything possible to lower your energy bills, you can include this decision. 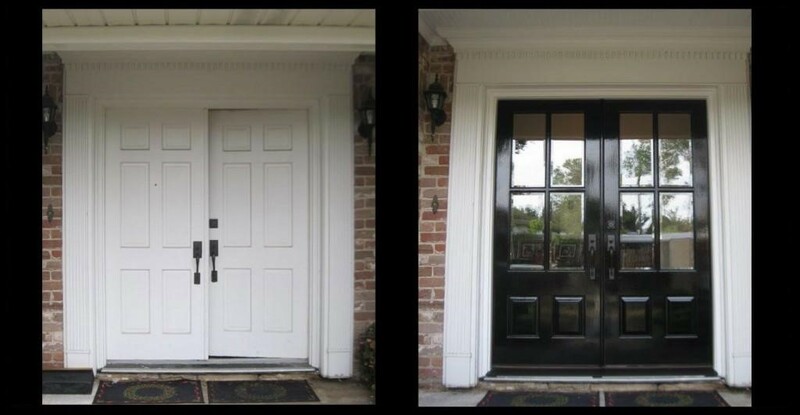 There are numerous signs that you should replace your front door, whether it has gotten worn or warped, or it is just outdated. Making this simple change will affect the whole look of your home, as well, and that’s another benefit of making this change. You don’t have to spend thousands of dollars or work for hours, either, since a door can be replaced quickly and easily. You will find it is a project you could complete over a weekend. To view Doors of Elegance’s extensive collection of doors, including beveled glass doors, wrought iron doors, french doors and carved solid wood doors visit our online website galleries.